This collection features original essays that examine Walter Benjamin’s and Theodor Adorno’s essays and correspondence on literature. Taken together, the essays present the view that these two monumental figures of 20th-century philosophy were not simply philosophers who wrote about literature, but that they developed their philosophies in and through their encounters with literature. Benjamin, Adorno, and the Experience of Literature is divided into three thematic sections. 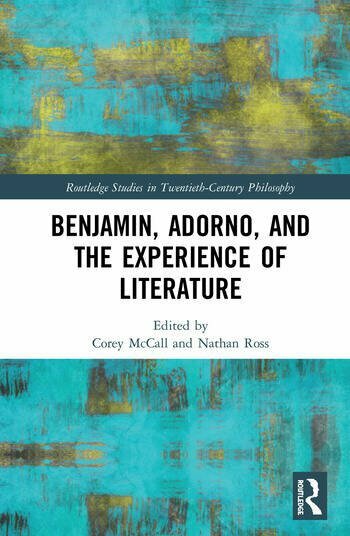 The first section contains essays that directly demonstrate the ways in which literature enriched the thinking of Benjamin and Adorno. It explores themes that are recognized to be central to their thinking—mimesis, the critique of historical progress, and the loss and recovery of experience—through their readings of literary authors such as Baudelaire, Beckett, and Proust. The second section continues the trajectory of the first by bringing together four essays on Benjamin’s and Adorno’s reading of Kafka, whose work helped them develop a distinctive critique of and response to capitalism. The third and final section focuses more intently on the question of what it means to gain authentically critical insight into a literary work. The essays examine Benjamin’s response to specific figures, including Georg Büchner, Robert Walser, and Julien Green, whose work he sees as neglected, undigested, or misunderstood. This book offers a unique examination of two pivotal 20th-century philosophers through the lens of their shared experiences with literature. It will appeal to a wide range of scholars across philosophy, literature, and German studies.